Do you love the idea of walking inside hardened lava from thousands of years ago? If so, you’ll want to explore some of the incredible lava tubes in Hawaii (most are located on the Big Island). According to the Hawaii Tourism Authority, lava caves are formed when a river of lava gradually builds solid walls and a ceiling. When the lava flow stops and the last of it passes downhill, a cave is formed. These caves can be a few feet high and only yards long, or they can stretch for miles with high ceilings. 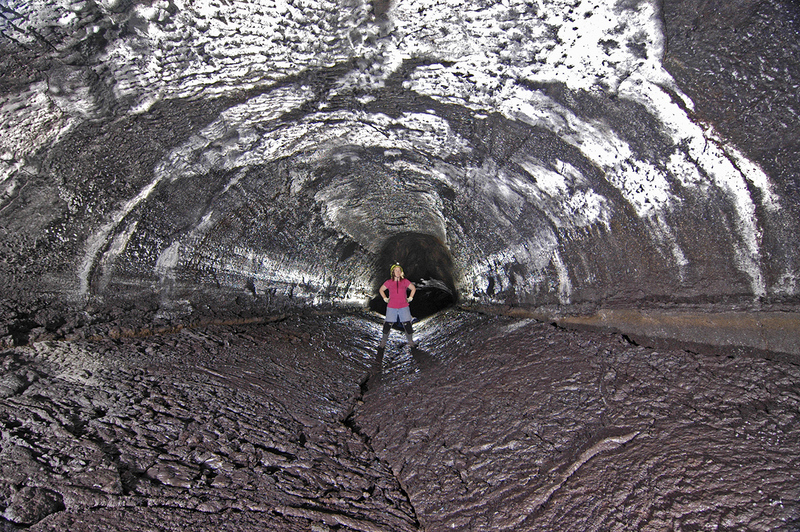 The Kazumura lava tube on the Big Island stretches for more than 40 miles and is the world's longest lava tube. Thurston Lava Tube (Nahuku): According to the Hawaii Tourism Authority, Nahuku is a 500-year old lava cave located within Hawaii Volcanoes National Park. Nahuku is the most easily accessible and is a fantastic example of a massive lava cave.Lit by electric lights, with a flat rock floor and a ceiling high enough in the center to keep you from scraping your head, this is a great introduction to lava tube geology. The solidified drips and waves of once-liquid lava rock clearly show the molten forces that created this cave. Your flashlight reveals beautiful shapes and colors of minerals leeching from the rock. After strolling the short, lighted section of Nahuku, there’s another segment past the steps leading back up the trail that’s completely dark with an uneven floor, so don’t venture there unless you are sure-footed and have a strong flashlight. Kazumura Cave: According to Kazumura Cave Tours, this cave formed between four and six centuries ago, when a vent on the east side of Kilauea Caldera erupted, sending lava down the northeast flank of the volcano. As these lava flows advanced, they cooled from the outside in. This produced a hard crust around the flow, which protected the lava from cooling too quickly. (Hawaiian lavas erupt at approximately 2165°F (1185°C). The air and ground temperature is therefore cold to lava.) In time, this protective crust thickened and confined the flow to an oval or rounded conduit referred to as a lava tube. 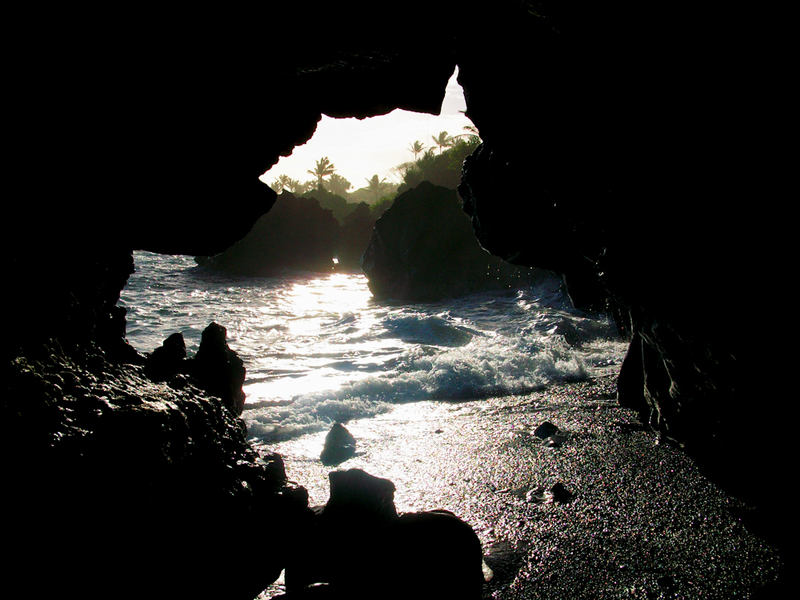 The Waianapanapa lava tube on Maui opens up to a black sand beach. Kula Kai Caverns: The Kula Kai Caverns are ancient lava tubes dating back hundreds of years. Created by the island’s volcanic activity, the caves were used over the millennia for shelter and as a source of water, according to Viator. If you want to learn about the history and geology of the caverns, it’s easy to book a tour. You’ll just want to make sure you’re geared-up: You’ll need a helmet, lights, pads and gloves to take the more demanding crawl tour or extended tour to more remote caves. If you’re heading to the Big Island and are interested in visiting one of the many lava tubes in Hawaii, consider which one will fit your needs, your budget, and your hiking ability. And make sure you book a Volcano Boat Tour, Helicopter Tour, or Hiking Tour through Hawaii Aloha Travel. That way, you can learn about not only the lava tubes, but the active volcano!